Marcus Aurelius Antoninus Augustus (April 26, 121 – March 17, 180) was Roman Emperor from 161 to his death. He was the last of the "Five Good Emperors" who governed the Roman Empire from 96 to 180, and is also considered one of the most important stoic philosophers. He was born Marcus Annius Catilius Severus, at marriage took the name Marcus Annius Verus. When he was named Emperor, he was given the name Marcus Aurelius Antoninus. Marcus Aurelius was the only son to Domitia Lucilla and Marcus Annius Verus. His only natural sibling was his younger sister Annia Cornificia Faustina, who was about 2 years younger than he. Domitia Lucilla came from a wealthy family who were of consular rank. His father was of Spanish origin, and served as a praetor and died when Marcus Aurelius was three years old. Marcus Aurelius credits him with teaching him "manliness without ostentation". His father's maternal aunt was Vibia Sabina, a Roman Empress and wife of Roman Emperor Hadrian. Rupilia Faustina (Marcus Aurelius' paternal grandmother) and Vibia Sabina were half-sisters and were daughters to Salonina Matidia (niece of the Roman Emperor Trajan). His father's sister was Faustina the Elder a Roman Empress who married the Roman Emperor Antoninus Pius. After his father's death, Aurelius was adopted and raised by mother and his paternal grandfather Marcus Annius Verus. His paternal grandfather died in 138, almost ninety years old. In 136, Hadrian had announced that his eventual successor would be a certain Lucius Ceionius Commodus, renamed L. Aelius Caesar. Marcus had already attracted the attention of Hadrian (who had nicknamed him verissimus): he was subsequently engaged to Ceionia Fabia, Commodus' daughter. The engagement, however, was annulled later after the death of Commodus, as Marcus was betrothed to Antoninus' daughter. Therefore, on the death of Hadrian's first adopted son L. Aelius Verus, Hadrian made it a precondition of making Antoninus his successor that Antoninus would adopt Marcus (then called Marcus Aelius Aurelius Verus) and Lucius Ceionius Commodus (Lucius Aelius' son, ten years junior than Marcus, renamed Lucius Aurelius Verus), and arrange for them to be next in the line. This Antoninus did, adopting and designating them as his successors on February 25, 138, when Marcus was only seventeen years of age. He would become emperor at 40. It has been suggested that Commodus and Antoninus Pius were designed by Hadrian only as "place warmers" for the young Marcus and Verus. The years of Marcus' life during the reign of Antoninus are known by the mean of his correspondence with one of the teachers assigned him by Hadrian, Fronto, a relevant figure in the culture of the time. Through these letters Marcus appears as an intelligent, serious-minded and hardworking youth. They also show the growing importance of philosophy for the future emperor: showing impatience for the unending exercises with Greek and Latin declamations, he later became fond of the Diatribai ("Discourses") of Epictetus, an important moral philosopher of the Stoic school. Marcus also started to have an increasing public role at the side of Antoninus, holding the place of consul in 140, 145 and 161 and increasing collaborating in decisions. In 147 he received the proconsular imperium outside Rome and the tribunicia potestas, the main formal powers of emperorship. In 145, Marcus married Annia Galeria Faustina, who was Antoninus' daughter and his cousin as well. Equestrian Statue of Marcus Aurelius on Capitoline Hill. When Antoninus Pius died (March 7, 161), Marcus accepted the throne on the condition that he and Verus were made joint emperors (Augusti). Though formally equal from the constitutional point of view, Verus, younger and probably less popular, looks to have been subordinate in practice. Marcus' insistence to have Verus elected with him was motivated by his loyalty towards the will of their adoptive father. The joint succession may have also been motivated by military experiences, since, during his reign, Marcus Aurelius was almost constantly at war with various peoples outside the empire. A highly authoritative figure was needed to command the troops, yet the emperor himself could not defend both the German and Parthian fronts at the same time. Neither could he simply appoint a general to lead the legions; earlier popular military leaders like Julius Caesar and Vespasian had used the military to overthrow the existing government and install themselves as supreme leaders. Marcus Aurelius solved the problem by sending Verus to command the legions in the east. Verus was authoritative enough to command the full loyalty of the troops, but already powerful enough that he had little incentive to overthrow Marcus. Verus remained loyal until his death on campaign in 169. This joint emperorship was faintly reminiscent of the political system of the Roman Republic, which functioned according to the principle of collegiality and did not allow a single person to hold supreme power. Joint rule was revived by Diocletian's establishment of the Tetrarchy in the late 3rd century. Immediately at the beginning of his reign, Marcus continued on the path of his predecessors by issuing numerous law reforms, mainly to clear away abuses and anomalies in the civil jurisprudence. In particular he promoted favourable measures towards categories like slaves, widows and minors; recognition to blood relationships in the field of succession was given. In the criminal law a distinction of class, with different punishments, was made between honestiores and humiliores ("The more honest" and "the more humble", respectively). Under Marcus' reign, the status of Christians remained the same since the time of Trajan. They were legally punishable, though in fact rarely persecuted. In 177 a group of Christians was martyrized at Lyon, for example, but the act is mainly attributable to the initiative of the local governor. 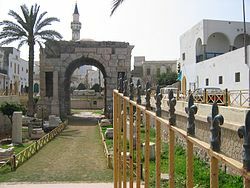 Marcus Aurelius Arch in Tripoli, built to commemorate the emperor. In Asia, a revitalized Parthian Empire renewed its assault in 161, defeating two Roman armies and invading Armenia and Syria. Marcus Aurelius sent his joint emperor Verus to command the legions in the east to face this threat. The war ended successfully in 166, although the merit must be mostly ascribed to subordinate generals like Gaius Avidius Cassius. On the return from the campaign, Verus was awarded with a triumph; the parade was unusual because it included the two emperors, their sons and unmarried daughters as a big family celebration. Marcus Aurelius' two sons, Commodus, five years old, and Annius Verus, of three, were elevated to the status of Caesar for the occasion. The returning army carried with them a plague which spread in the whole empire for several years. At the time of Marcus Aurelius, the chronicles of the Han Dynasty say that in 166, Roman representatives met Huan, the emperor of China, in the Chinese capital of Luoyang. According to the chronicles, the Romans stated that they had been sent by Antun. Given the year, this may have been Marcus Aurelius Antoninus. On the other hand, contemporary Roman chronicles make no mention of any attempts to contact the Chinese. Marcus Aurelius died on March 17, 180 in the city of Vindobona (modern Vienna). His son and successor Commodus was with him. He was immediately deified and his ashes were returned to Rome, and rested in Hadrian's mausoleum (modern Castel Sant'Angelo) until the Visigoth sack of the city in 410. His campaigns against Germans and Sarmatians were also commemorated by a column in Rome. Marcus Aurelius was able to secure the succession for Commodus, whom he had named Caesar in 166 and made co-emperor in in 177, though the choice may have been unknowingly unfortunate. This decision, which put an end to the fortunate series of "adoptive emperors", was highly criticized by later historians since Commodus was a political and military outsider, as well as an extreme egotist with neurotic problems. For this reason, Marcus Aurelius' death is often held to have been the end of the Pax Romana. It is possible that he chose Commodus simply in the absence of other candidates, or as a result of the fear of succession issues and the possibility of civil war. While on campaign between 170 and 180, Aurelius wrote his Meditations as a source for his own guidance and self-improvement. He had been a priest at the sacrificial altars of Roman service and was an eager patriot. He had a logical mind though his notes were representative of Stoic philosophy and spirituality. Meditations is still revered as a literary monument to a government of service and duty. It has been praised for its "exquisite accent and its infinite tenderness" and "saintliness", and has also been called the "gospel of his life." John Stuart Mill, in his Utility of Religion, compared the Meditations to the Sermon on the Mount. The book itself was first published in 1558 in Zurich, from a manuscript copy that is now lost. The only other surviving complete copy of the manuscript is in the Vatican library. The significance of death was very important in the philosophy of Marcus Aurelius. He didn't believe in the afterlife. He wrote: 'We live for an instant, only to be swallowed in "complete forgetfulness and the void of infinite time on this side of us." "Think how many ere now, after passing their life in implacable enmity, suspicion, hatred... are now dead and burnt to ashes." According to Marcus Aurelius everything will be turned in absolute oblivion, even legends. "Of the life of man the duration is but a point, its substance streaming away, its perception dim, the fabric of the entire body prone to decay, and the soul a vortex, and fortune incalculable, and fame uncertain. In a word all things of the body are as a river, and the things of the soul as a dream and a vapour; and life is a warfare and a pilgrim's sojourn, and fame after death is only forgetfulness." 'Everything existing "is already disintegrating and changing... everything is by nature made but to die." 'The length of one's life is irrelevant, "for look at the yawning gulf of time behind thee and before thee at another infinity to come. In this eternity the life of a baby of three days and the life of a nestor of three centuries are as one." 'To desire is to be permanently disappointed and disturbed, since everything we desire in this world is "empty and corrupt and paltry." For Marcus Aurelius, death was desirable, because it would make an end to all desires. Despite his thoughts on life and death, Marcus Aurelius was an advocate of rational virtue. According to Jonothan Dollimore, Marcus Aurelius had a kind of indifference towards the brutalities in life. As an emperor, he persecuted Christians and went frequently on military campaigns. He justified his deeds by pointing at the insignificance of worldly affairs. In Western culture, this was a tendency found increasingly in later centuries. Memoirs of Hadrian, by Marguerite Yourcenar. Mémoires d'Hadrien (1951), a fictitious but plausible autobiography (in form of a series of letters directed to his adoptive grandson "Marcus") of one of his predecessors, Hadrian, by Marguerite Yourcenar. It is one of the best-selling European novels of the 20th century. Household Gods, a 1999 novel by Judith Tarr and Harry Turtledove. The movie The Silence of the Lambs publicized Marcus Aurelius' principle, from Meditations: "For any particular thing, ask, 'What is it in itself? What is its nature?'" Marcus Aurelius habitually took opium to sleep and to cope with the difficulty of military campaigns.